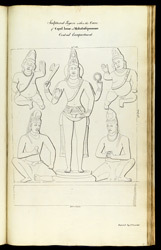 Pen and ink drawing copied by John Gould of sculptured figures in a cave temple at Mamallapuram, from an Album of 37 drawings of the temples and sculptures at Mamallapuram, also plans of the site, dated 1816. Mamallapuram, a tiny village south of Madras, was a flourishing port of the Pallava dynasty during the 7th - 8th centuries. The site, which covers several square miles, is famous for a series of monuments which date from the reign of Mamalla (c.630-68) and Rajasimha (c.700-728). Most of the monuments are rock-cut and were carved out of boulders and cliffs. A series of rock-cut cave temples were excavated during Mamalla's reign into the sides of a granite hill not far from the sea. On the eastern side of the hill there is the celebrated relief variously identifies as the 'Penance of Arjuna' or the 'Descent of the River Ganga' covering two large boulders. One kilometer south of the main hill there is the group of the Pancha Rathas, five free-standing monolithic replicas of various temple types. Located east of the main hill beside the sea stands the Shore temple ascribed to the reign of Rajasimha and constituting one of the earliest structural monuments of the Pallavas. On the outskirts, west and north of the site, there are some small monolithic temples and cave temples.